Somebody responded to this photo of an orange tree on Facebook by saying, “Thanks Jill but I don’t have to be Parisian to enjoy oranges”. Of course she was right. But she didn’t get the point. For a start, I’m not Parisian – although I do have a French-Parisian diary. 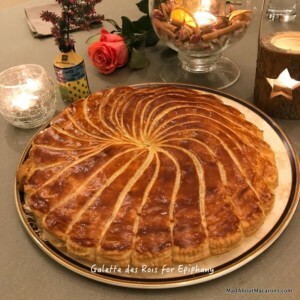 It’s useful to note that Mother’s Day in France is on Sunday 29 May but each year I’m taken by surprise and suddenly remember what my diary doesn’t tell me: in the UK, Mother’s Day comes on 6 March. So now we know I’m dead for forgetting my Mum’s day on time for Sunday, let’s walk around Paris together and talk about oranges. 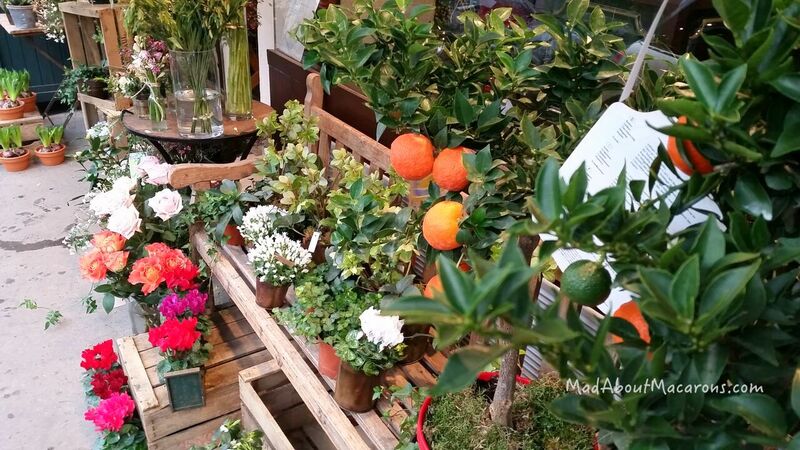 At this chilly time of year, orange trees feature in many Parisian florists, decorating their entrances to brighten the path. I always dream when I pass them, wishing I was living in Versailles with an Orangerie to look after them in style. 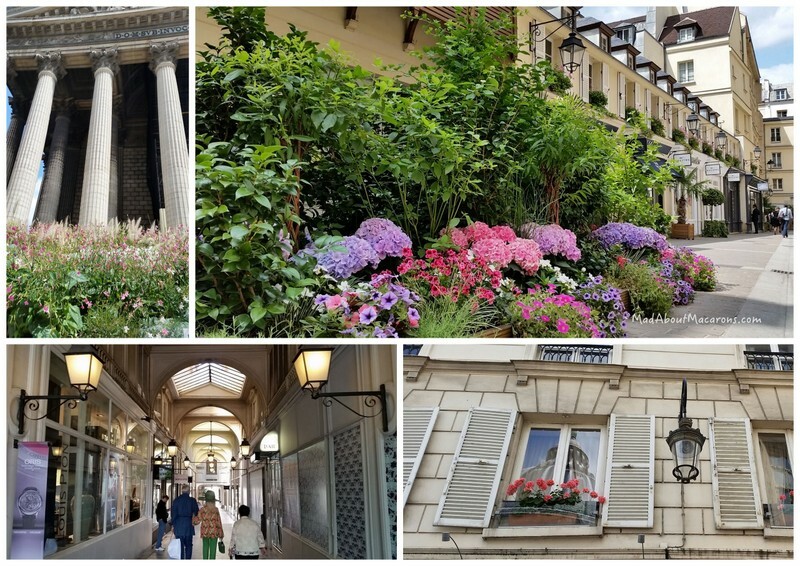 We don’t live far from Versailles, but I’m sure if I took an orange bush home, they would just wilt and die on me so I prefer to window shop. Just around the corner from this little florist off Rue du Bac, is a rather highbrow gourmet patisserie, Hugo & Victor on Boulevard Raspail. The decor is stunning: dramatic black walls highlight their exquisite pastries which all centre around a seasonal theme. 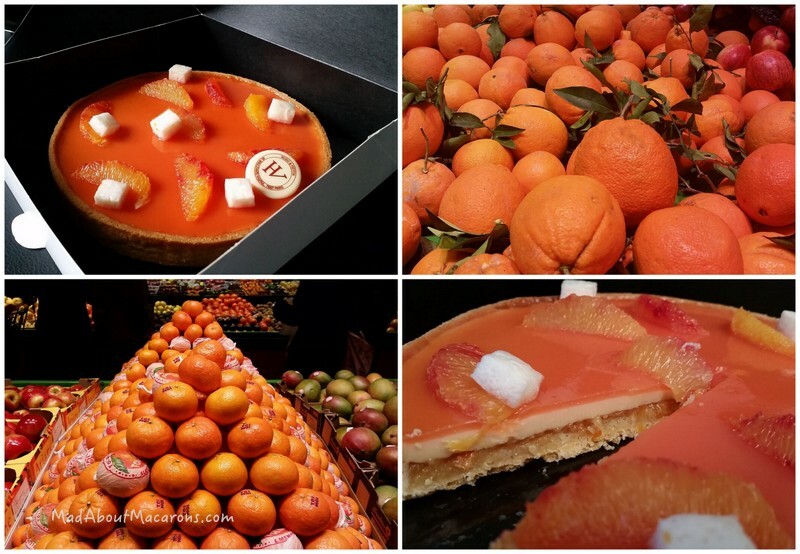 Oranges being the sweet seasonal jewels of the day, I know Mum would be so impressed watching the chic assistant pack this glistening blood orange tart into a simple black interior pastry box. The black box emphasises that this is pure pastry art, decorated with supreme segments and cubes of marshmallow. Back home, tasting the tart’s sumptuousness with different layers from compote to cream to its shiny glaze, I wanted to rustle up something with orange too – but a LOT simpler. The signs were all there: our local market (Mum loves coming here each time she visits) was piled high with clementines and untreated oranges, begging to be grated, juiced and segmented for some kind of citrusy dessert. 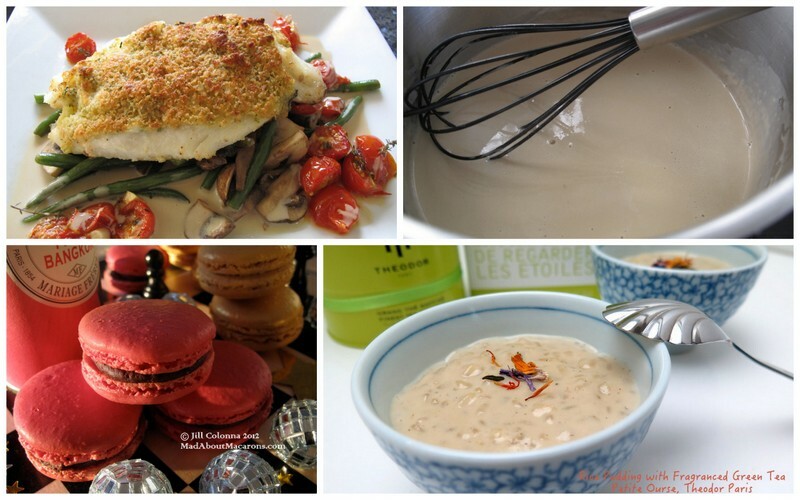 While a creamy orange curd is just perfect as a topping on crêpes, I couldn’t help opening up Teatime in Paris and playing around with a few recipes. 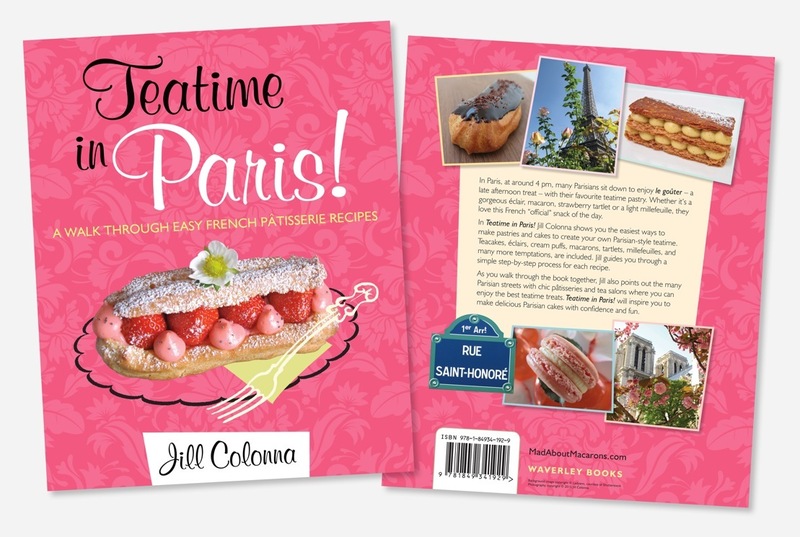 The idea behind Teatime in Paris is to mix and match some of the recipes and I give ideas for variations throughout the book. One of my favourites in the Tart Chapter is a Lemon and Passion Fruit Meringue Tartlet. As the orange doesn’t have the same tart zingy taste as lemon, there was no need to add the sweet meringue and so the tartlet was even quicker. It’s also just as simple to change the citrus juice – as I weigh the juice in the book rather than give it in volume (I give the exact amount needed for the juice which is far more exact). So I added just one passion fruit and made up the rest in orange juice to create an orange and passion tart. It’s certainly not as arty and professional looking as the tart in Hugo & Victor here but I can tell you the acidity of the passion with the orange was divine. I show you how to make crumble choux puffs in Teatime, with discs of craquelin or crumble before baking. This time, I added a pinch of orange powdered food colouring as I creamed the butter for the crumble and this was the result: Orange Crumble Choux puffs. 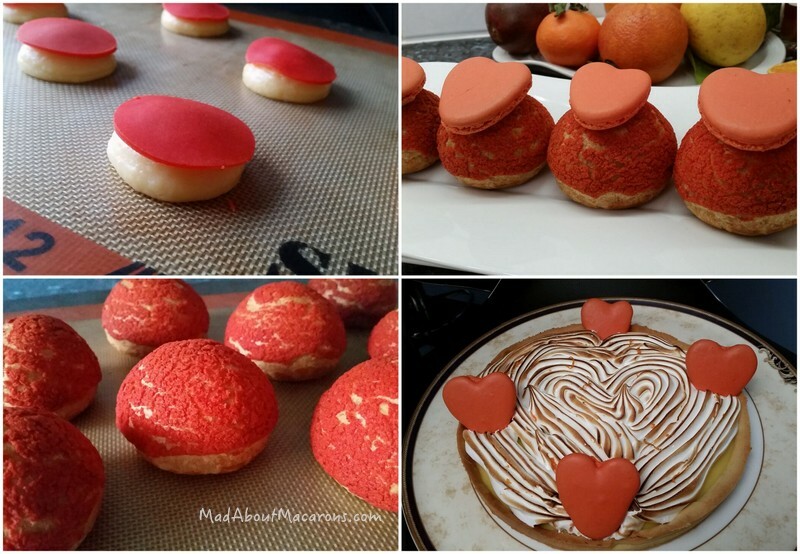 Filled with the passion fruit and orange tart filling, these crumble puffs are given the macaron hat look with a few macaron shells stored in the freezer bank. 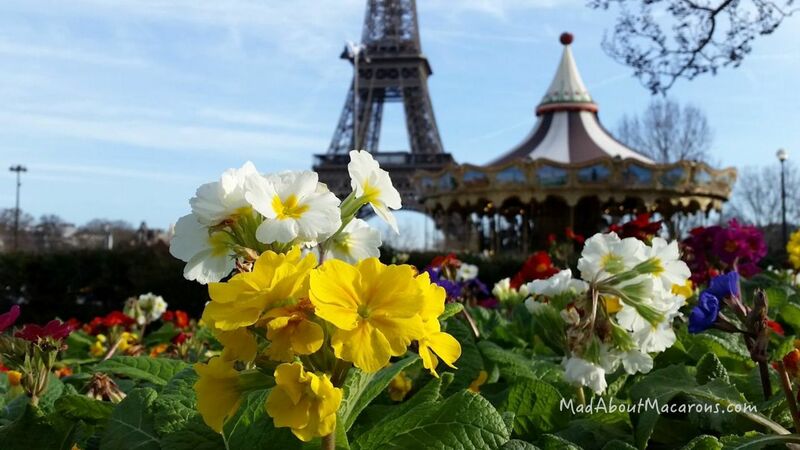 There are perhaps no orange primroses at the Eiffel Tower, but these white and yellow primroses have been cheering us up with their bright colours while we’re now dashing in between les giboulées de mars (rain storms of March). Our UK “April showers” are in March in France: again, our French vs UK diaries are reversed! Yesterday in between sunshine, we even had snow and today a hailstorm! Which reminds me: my Mum always looks beautiful in scarves. 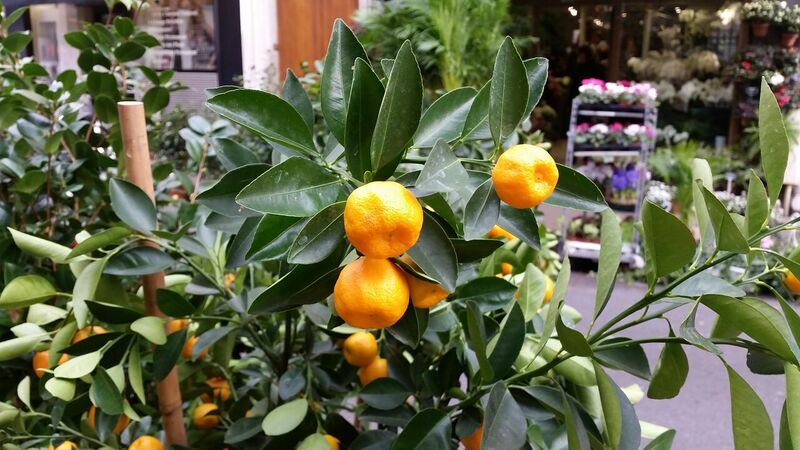 There’s something warming and exotic when you add a touch of orange blossom to cooking or baking. 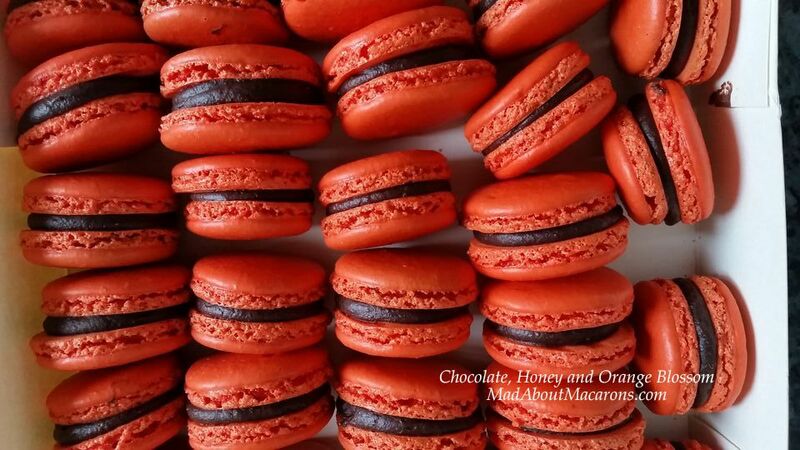 I guess it’s too late to send Mum these Chocolate, Honey and Orange Blossom macarons from Teatime in Paris. So if you’re in the UK and live near your Mum, spoil her like mad this Sunday. I know my Mum would love these lusciously rich and buttery chocolate chip Financiers from the first chapter of Teatime in Paris. 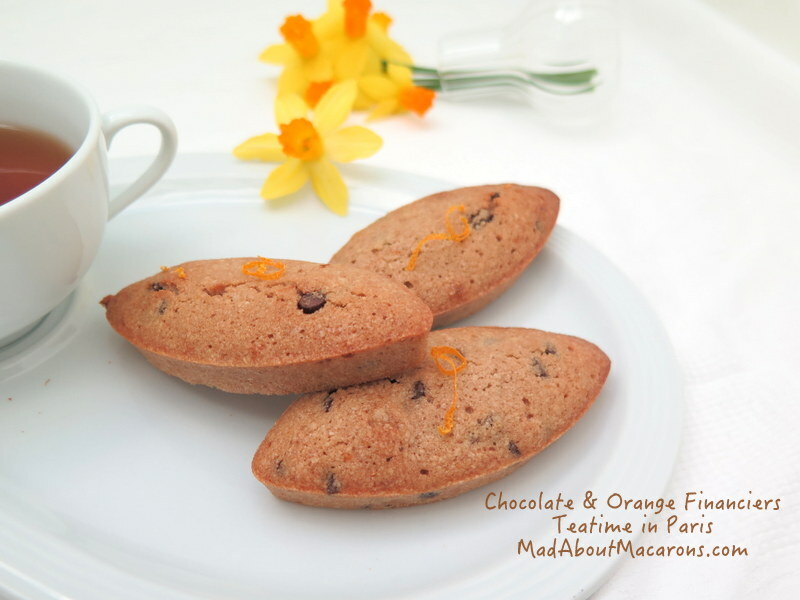 I simply added the grated rind of an orange to them for some extra zing with a cup of tea. I know you don’t need to be in Paris to enjoy oranges or daffodils at this time of year, but here’s wishing all of you wonderful Mums the most lovely Mothering Sunday this weekend in the UK – and with a copy of Teatime in Paris, why not bring a touch of Parisian spring to your kitchen? And to my own, dearest SuperMum, I look forward to spoiling you on your next trip. Hurry and spring back to Paris soon! Who would have thought that the good old Apple Crumble would be so popular in Paris these days? And trust the French to make it sound so romantic as “crrum-belle”! 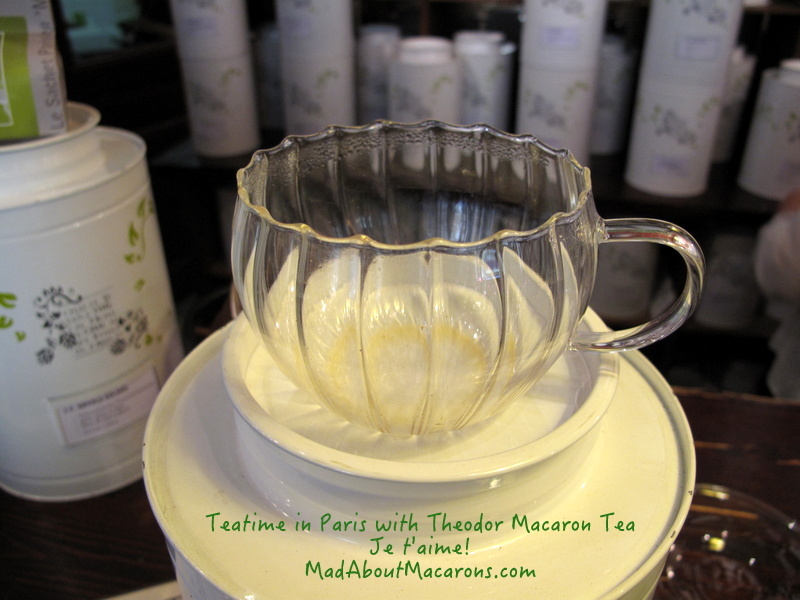 The Teatime in Paris Pastry Walking Tour! It’s great to be back in Paris and settle into a good old routine! As I’m starting to get organised around a more serious school year’s schedule, this rentrée is different. 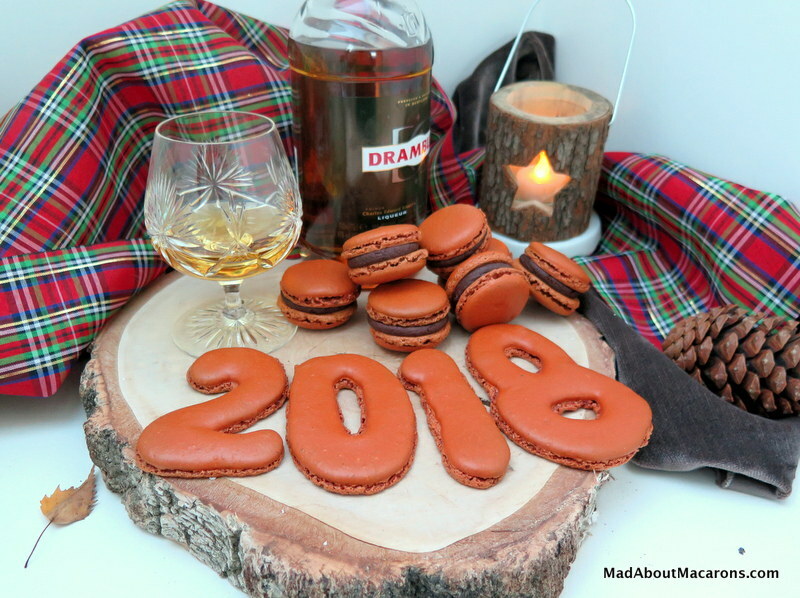 Thanks to my lovely colleagues at Context Travel, I’m thrilled to be leading a brand NEW macaron, pastry and chocolate walking tour to coincide with my new book. 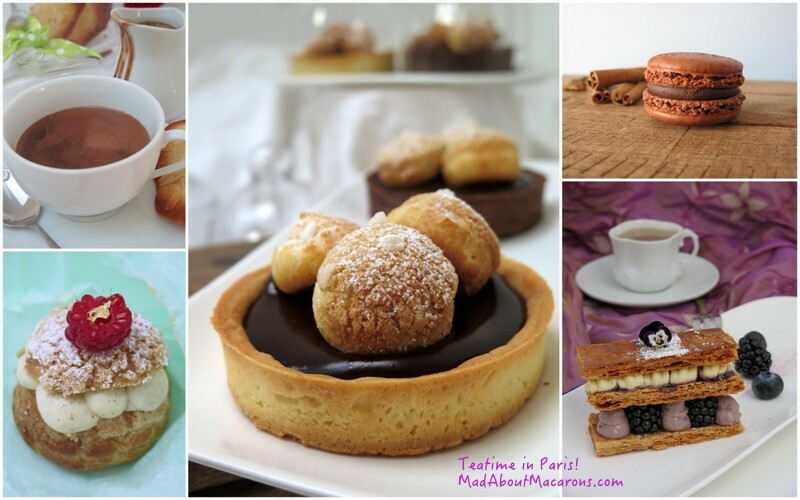 Welcome to the Teatime in Paris Pastry Walk! 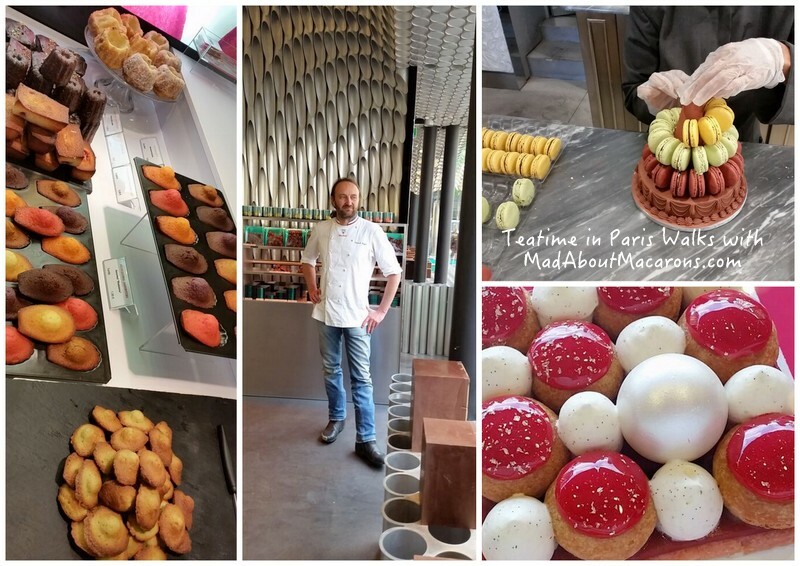 If you love Paris, pastries, chocolate, macarons and like to bake at home, then this walking tour is right up your street. 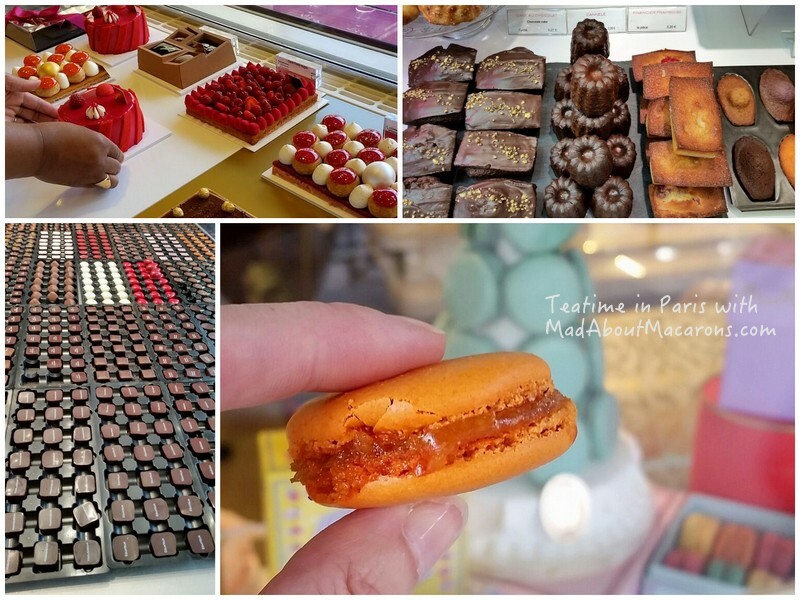 Just as I do in the book, I’ll be walking you around some of the finest pastry and chocolate boutiques, pointing out some of the lesser known spots along the way. Don’t come after a large lunch: we’ll also be tasting many of the finest and award-winning éclairs, tarts, financiers, canelés, madeleines, macarons, chocolates and pralines, just to name a few. With Autumn on us, it’s the perfect time to enjoy a taste of decadent hot chocolate too. As we sample, we’ll talk about their Parisian history and how they’re made – so for budding bakers, your questions are welcome. 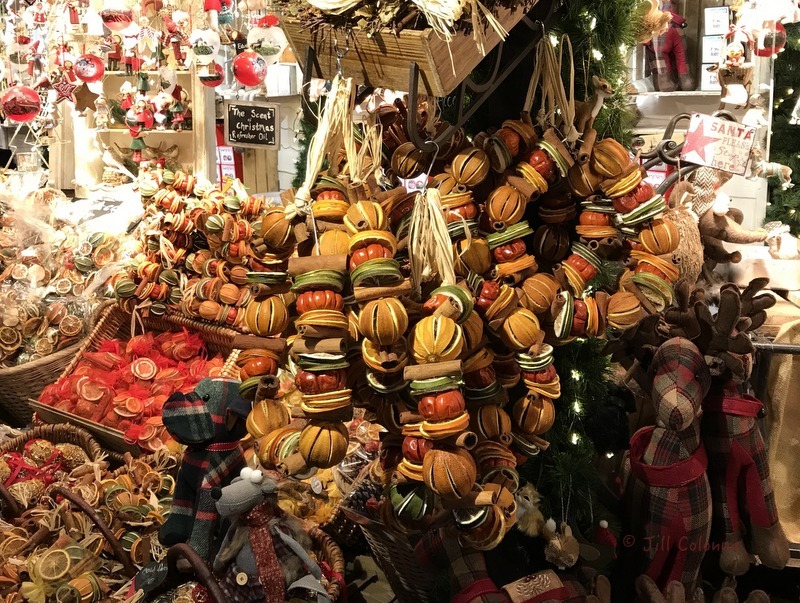 The tour will take place on Mondays and Tuesdays until end October – ideal for that long weekend trip – as these days are best for enjoying the boutiques at our own pace during 2.5 hours and avoiding the more hustle and bustle of the 8th arrondissement at peak times. And with no more than 6 people in the group, it’s a personal experience. To finish off, included in this one-off exceptional tour is your own copy of my new cookbook and armchair sweet travel guide. 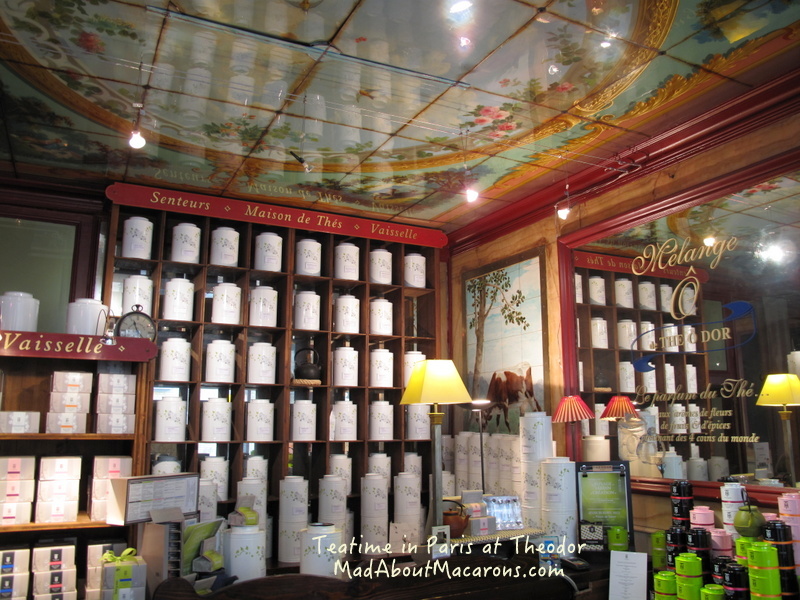 For an idea what’s inside, see About Teatime in Paris. 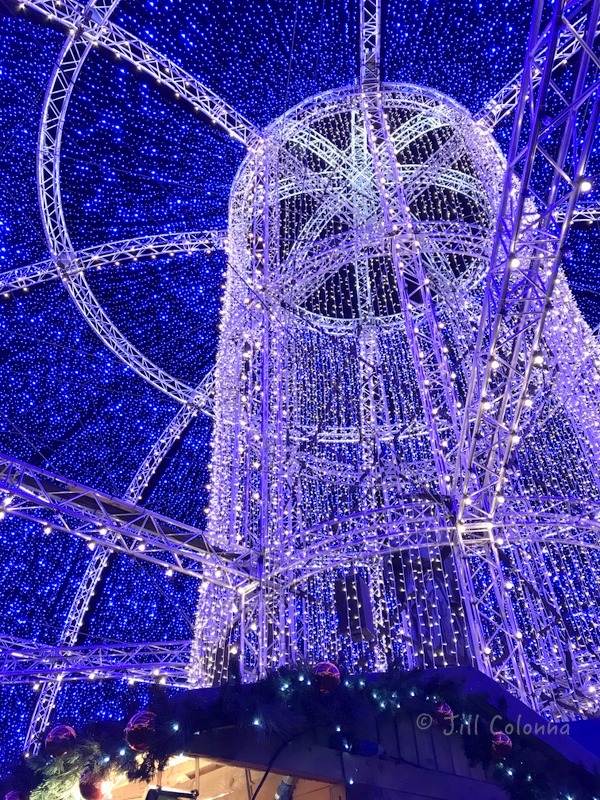 For those of you not in Paris, don’t worry; it doesn’t stop here. 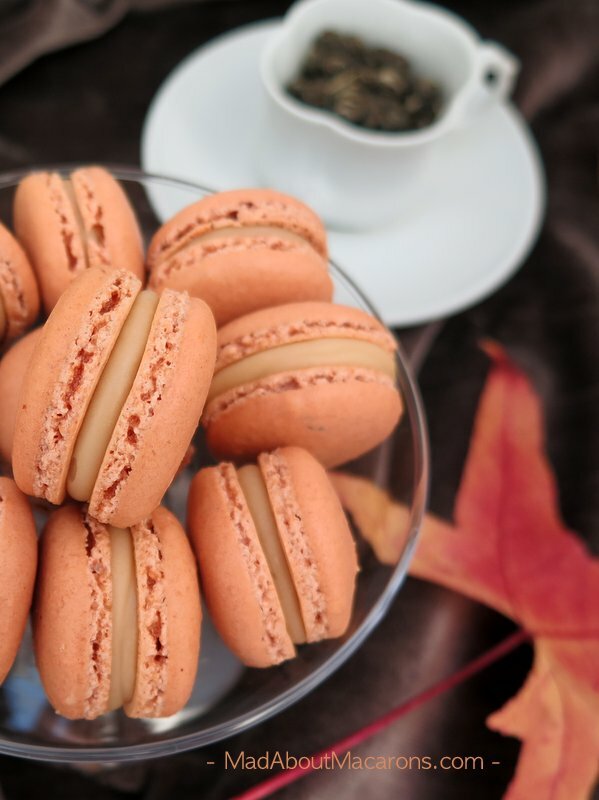 With Teatime in Paris you can make your own Parisian-style hot chocolate, teacakes, macarons and pastries for a special teatime at home. Thanks to Waverley Books, there’s a special offer until the end of September on Amazon.co.uk. It’s also competition time in the UK over at Party Pieces. So hurry – you still have until noon on Monday 14th September to enter the Teatime in Paris UK giveaway. 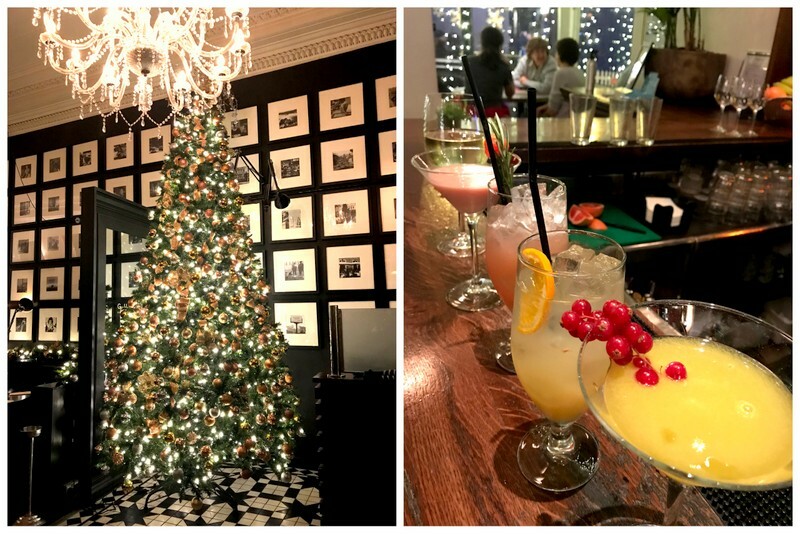 You could be one of the 4 lucky winners… good luck! Have you tried these Chocolate – Earl Grey Tarlets with Orange-Liqueur Crumble Puffs yet from the Tea Party chapter? I’ll be continuing to make recipes from the book on my FB page or instagram feed. 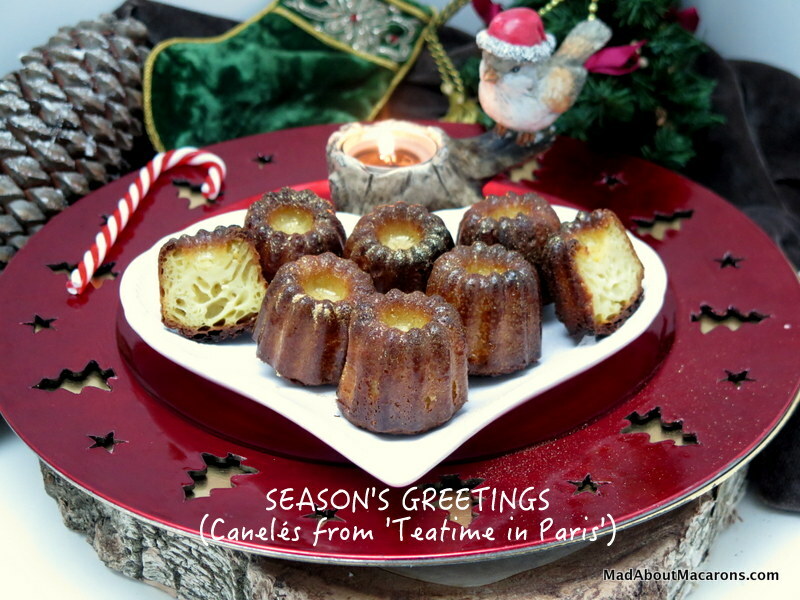 In the meantime, I hope to see you very soon on the Teatime in Paris Pastry Walk with Context Travel . P.S. I forgot to tell you the most important part: it’s also simply great fun! 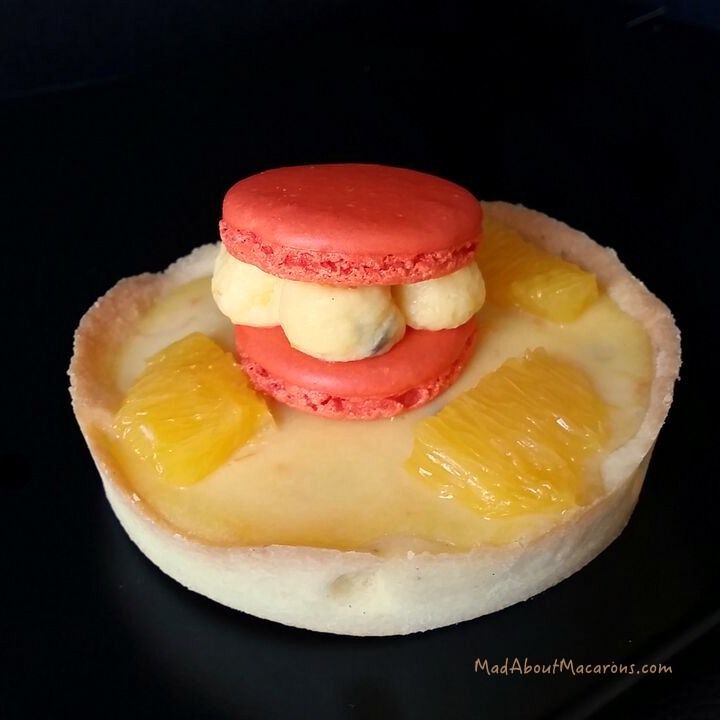 https://madaboutmacarons.com/wp-content/uploads/2015/09/saint-honore-pastry-teatime-in-paris.jpg 504 763 Jill Colonna https://madaboutmacarons.com/wp-content/uploads/2015/04/logo-mad-about-macarons.png Jill Colonna2015-09-10 09:30:022015-09-13 13:52:37The Teatime in Paris Pastry Walking Tour! I didn’t think I’d actually fall in love with tea. 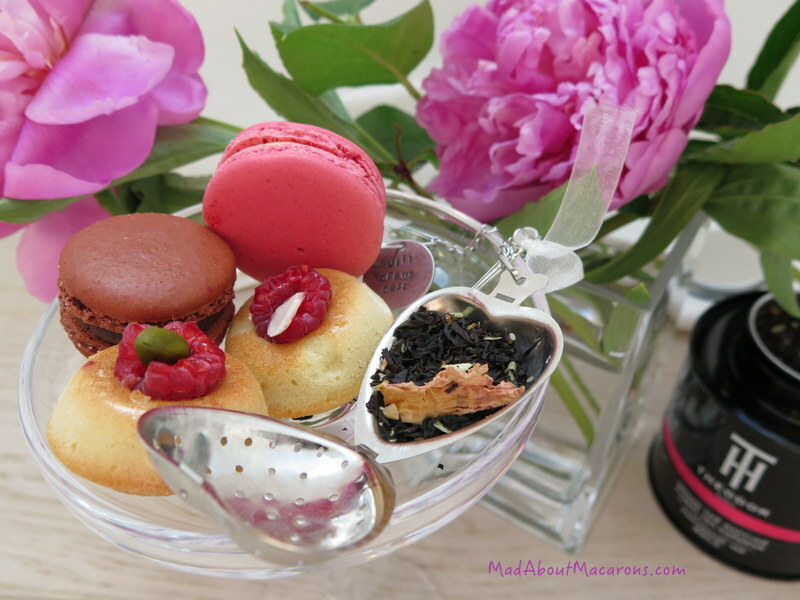 Can you imagine a tea with scents of macarons and pistachios? Heaven. On top of it, this unique brew is called “I Love You” – Je t’aime. 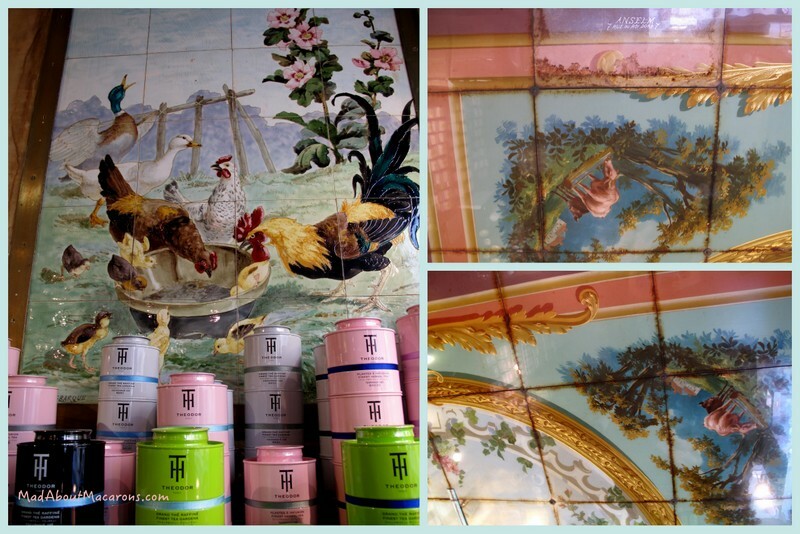 The teas of Theodor Paris have been a very recent discovery of mine thanks to my friend, Francis for introducing me to Monsieur Leleu’s new creation, the Absolu Oolong. And when I say discovery, it’s not just that his speciality teas are so different to anything else I’ve ever tasted; like drinking good wine, they’ve helped me learn to appreciate teas’ deliciously complex aromas; take the time and pleasure with my cuppa; (I know, I know – this sounds corny but it’s true…) even evoke a smile. I’m so glad I popped in to the original boutique where Theodor started in the 16th arrondissement. It’s just a few minutes walk from Trocadero and I thoroughly recommend a visit with the charming Sylvie. Previously a creamery, the decor is still testament to such a location with the ceiling and wall panels by Anselm in Rue du Roi Doré (golden king street) in the 7th. 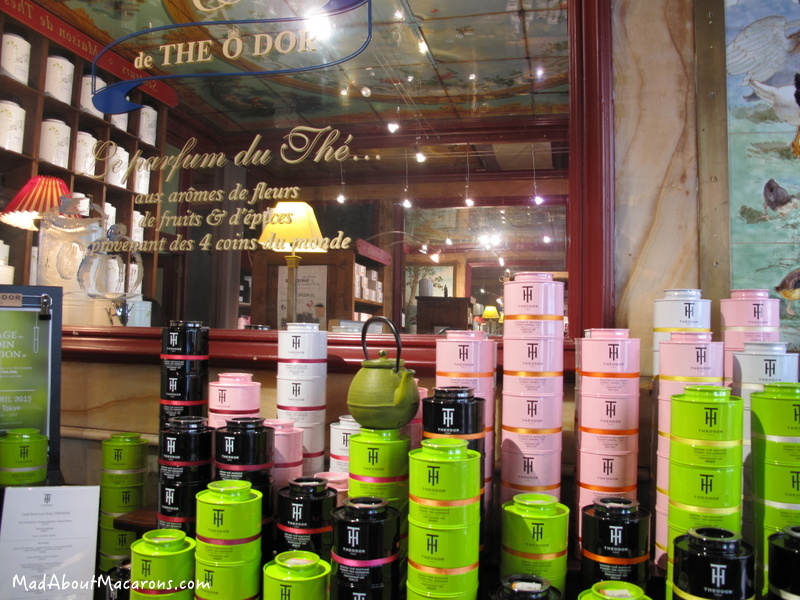 Guillaume Leleu started up this first shop here in 2002 and since then has been taking the tea world by storm with his Theodor creations, now in 30 different countries. Each year about 100 tons of teas personally selected from around the world (mostly from Asia) are transformed in his zen-like laboratory in the previous Singer factory in Bonnières sur Seine, within rowing-boat distance from Monet’s gardens at Giverny. 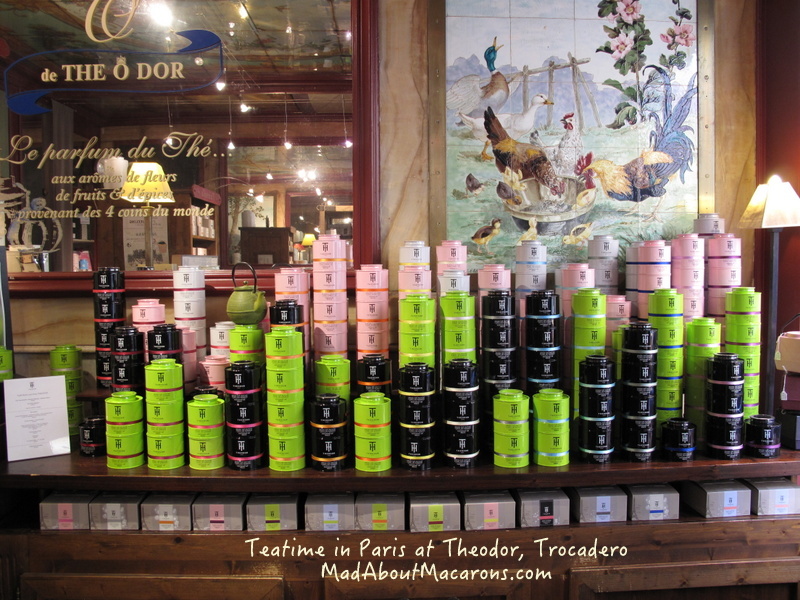 Calling himself the Insolent Parisian, Theodor’s founder has us travel with him – whether it’s through the descriptions of his teas or online – finding beauty in everyday things through his poetic words, embodying the art of tea. The inspiration of the Impertinent Parisian is embodied in sixteen essences that form the aromatic tea palette in an impertinent and poetic way. Impertinent, because it tempts us to take a shortcut and welcome the unexpected. 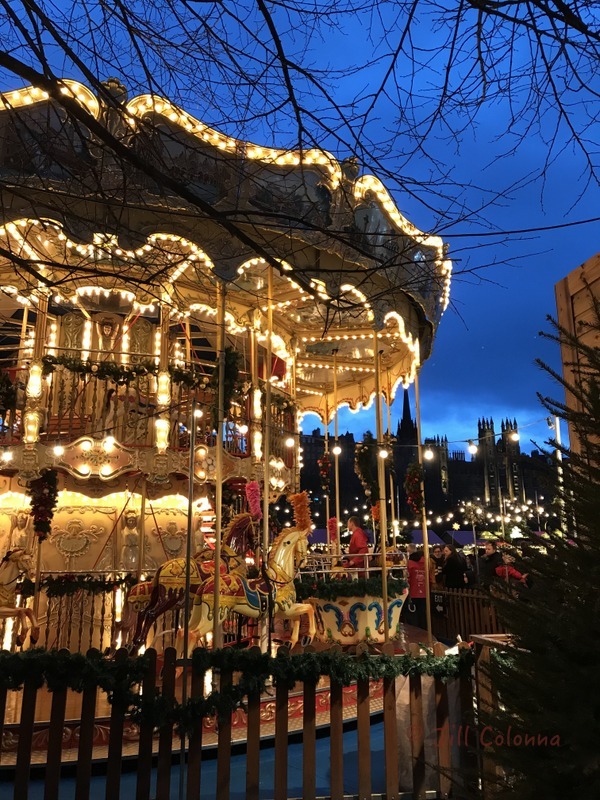 Poetic, because it makes us discover shifting horizons and jostles our view and senses, provoking us to a game of desire and astonishment in disguise, while inviting us to marvel in front of the revisited daily Parisian routine. Such impertinent essences are represented by 16 colourful satin ribbons that make a statement around each of the characteristic tea tins containing teas of origin, black flavoured teas, green flavoured teas, infusions named “weeds” or herbal teas. The day I visited, Marìa, also from the talented Theodor team, made a pot of this rather special brew. I Love You‘s pronounced fragrances are indeed pistachio and macaron. 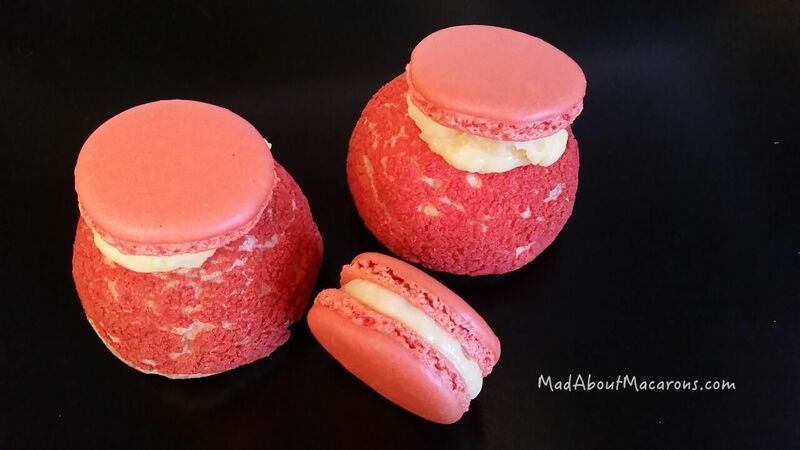 Like an alchemist in the kitchen or in a perfumery, Monsieur Leleu creates the macaron flavour by adding ingredients such as pink peony petals (clearly visible), bitter almond, coconut, chocolate, chopped almond pieces, and coconut shavings. Just as with tasting wine, when the tea was finished I loved swirling around the end of the tea to gather all of the wonderful aromas around the empty, fragranced teacup. 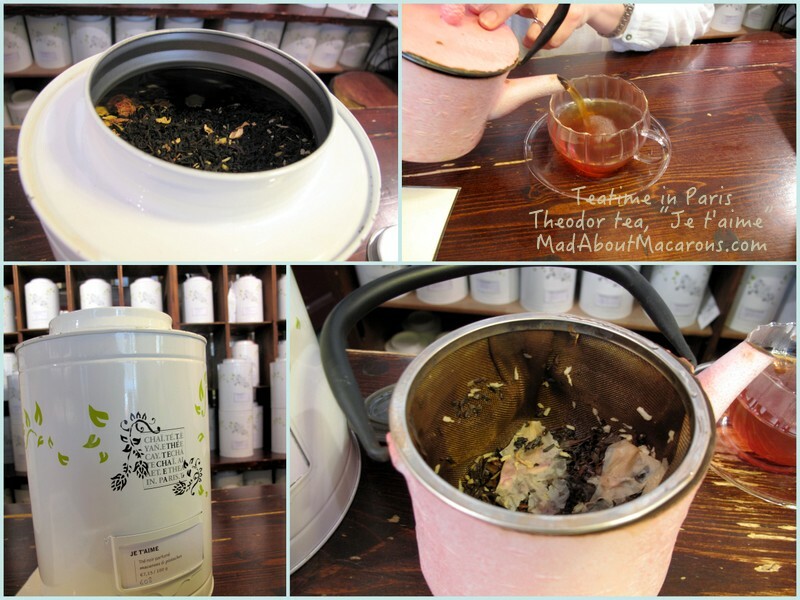 This macaron tea has a loving green tea sister, J’aime, flavoured with notes of macaron and strawberry. 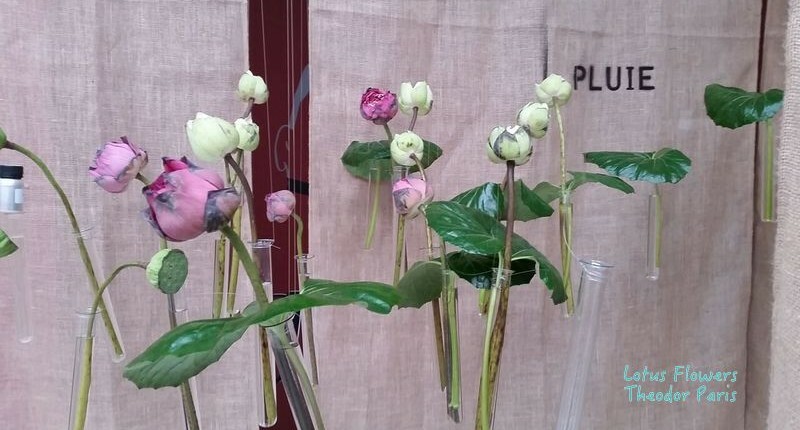 As more gigantic tea containers were opened, it was intriguing to sniff revel in the different tea leaves’ bouquets with their added surprises which make up each and every creation. Jour J (meaning “The Big Day”) is aptly named, as this dreamy white tea (Bai Mu Dan) has astonishing notes to resemble the flavour and sensation of rosé Champagne. Monsieur Leleu cleverly concocts this sensation by adding bits of strawberry, helianthus (or sunflower) petals and jasmine flowers, just to name a few of the magical ingredients. This Carpe Diem is red rooibos tea, with “greedy” (that’s another of the 16 essences) notes of red fruits, toasted and sugar-coated almonds. 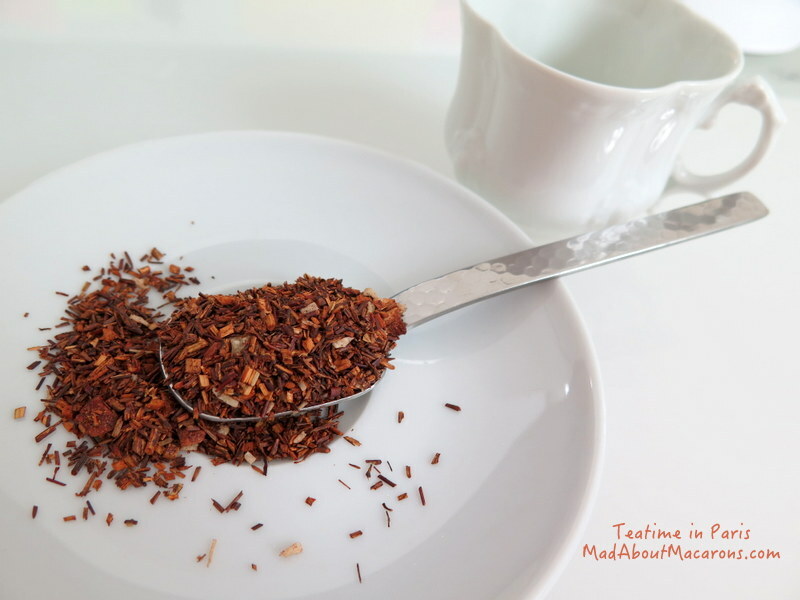 Marìa suggested using this tea to perfume rice by placing just a couple of teaspoons in it while cooking. Try it. It’s genius! Try making this fragranced green tea-infused rice pudding recipe and see what I mean. Blue Oolong Lotus is a green tea from Vietnam and the lotus flower is used to impart a scent to the tea leaves by placing them inside the flower just before it closes at night to take on the fragrance of this very special flower. How’s that for creativity? 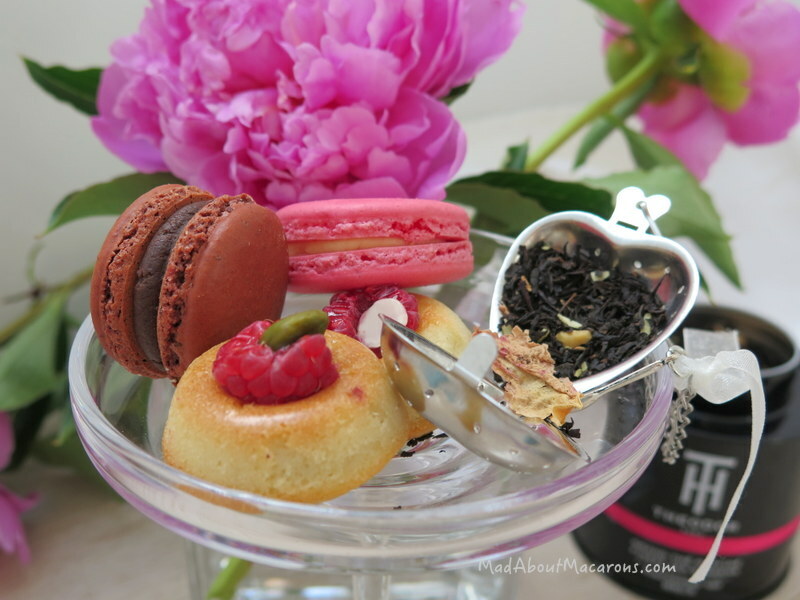 The perfect “tea gourmet”: a cup or two of I Love You, rose and chocolate macarons and some almond financier teacakes (the recipes are all in Teatime in Paris). The only way to have a cup of tea, is by loving it. I’ll drink to that, Monsieur Leleu. Cheers to discovering the unexpected, new views and senses, and revisiting daily Parisian routine.